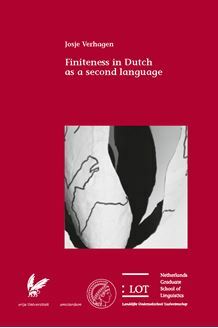 This dissertation investigates how second language (L2) learners of Dutch with Moroccan Arabic or Turkish as their native language acquire finiteness, that is, the form and placement of finite verbs. Results from production as well as processing tasks show that finiteness is acquired in stages that are internally consistent and largely independent of learners’ native language. Initially, L2 learners produce non­finite verbs that are placed in final position (e.g., Het meisje niet lopen ‘The girl not walk’), and not yet sentences in which a finite verb occurs in raised position (e.g., Het meisje loopt niet ‘The girl walks not’). The acquisition of auxiliary verbs constitutes an important step: prior to the acquisition of auxiliaries, learners mainly produce non­finite verb forms and word order is determined by semantic principles. After the acquisition of auxiliary verbs, morphosyntactic principles such as verb­raising and subject­verb agreement come in. This development from a non­finite to a finite system is a gradual process, however, in which grammatical knowledge is often applied for language processing before it is put to active use in production.